I have been hanging out with my vegetarian friends lately, and have gradually become more familiar with the vegetarian restaurant scene in Hong Kong. R, L and I tried out VeggieSF on Stanley Street, which has an eclectic setting inspired by San Francisco in the 50’s. 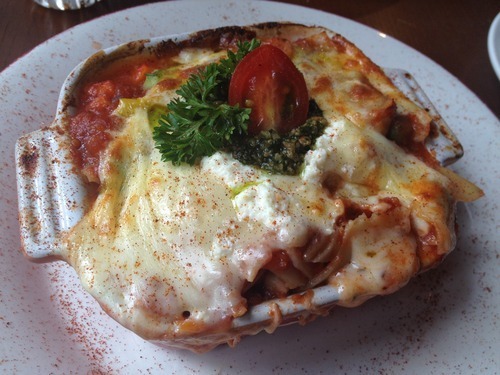 The international selection on the menu is inspiring, and you will be able to find items ranging from Vietnamese vermicelli and Japanese tempura to Lasagna, burgers and pastas. Main courses on the menu cost around $98 to $108, and for lunch you will get a free upgrade which includes one soup and one House Beverage. 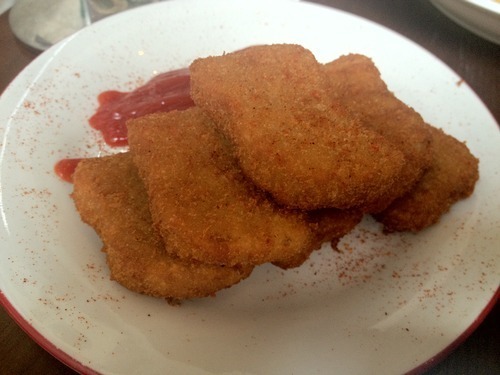 This Crispy Nuggets ($38) is a side dish and my friend, L, loved it! It is crispy on the outside like normal chicken nuggets, and its texture is really chewy, which makes it even better than chicken nuggets which are simply soft and pliable. Not to mention that they are full of “meaty” flavours as well! 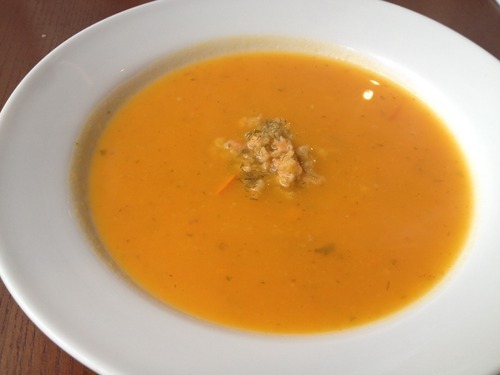 The Broad Beans and Carrot Soup, which came with the set lunch, tasted quite bland. It had a good texture thanks to the chunky vegetable bits, but was too watery. 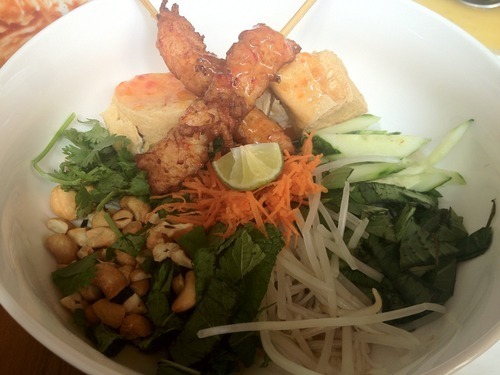 (1) This Oakland Breeze ($98) is Vietnamese Style mixed Vermicelli with Fried Tofu & Skewers. The seasoning was sharp and definite, just like what you would get in Vietnamese restaurants, and the tofu and skewers were crunchy and nicely smothered in an appetising sweet and sour sauce. The whole dish was very refreshing and it was one of the lighter options at VeggieSF. (2) This rice is called Sashimi 101 ($108) and it comprised of Rainbow Vegetable, Kelp Konjac, and Tempura served with Organic Sushi Rice. The veggie tempura was delicious and the other vegetables had been nicely grilled, giving them a gorgeous crunch. The sauce for this rice was thick and creamy, and there was an appealing hint of coconut milk. 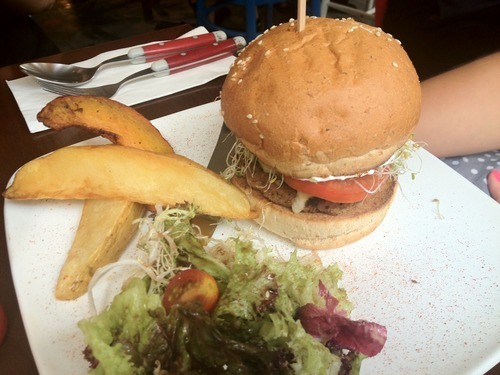 (3) I am Fabulous ($108) is a signature dish, and you could choose from a selection of patties for your Fabulous Burger. It was served with Potato Pumpkin Wedges and a Mixed Salad on the side. We liked the large, rustic potato pumpkin wedges, and the patty we picked was the Crispy Black Pepper Soy Patty, which was chewy and had a good thickness. (4) This Fuselli ($108) was dressed in a vibrant and refreshing pesto and tomato sauce. 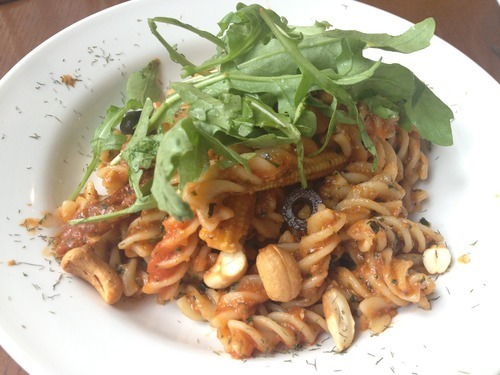 The fuselli was reasonably al dente, and the cashew nuts, olives and baby corn gave this dish a combination of interesting flavours and textures. Similar to the Vietnamese vermicelli above, this Fuselli was a light option which would be less likely to give you a food coma after lunch! 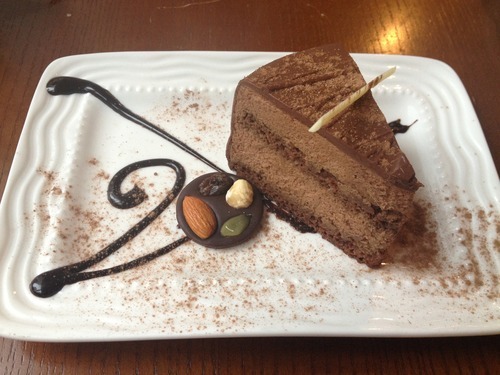 Having finished the main courses, we ordered a Chocolate truffle cake ($38), and it was more fluffy and less heavy than the normal chocolate cakes, in a good way! Light, smooth and not too sweet, it was a soothing dessert to end our meal. The set lunch also comes with a beverage, and I ordered the FairTrade Organic Soy Coffee. Not everyone would like soy coffee, as it is much more bland and watery than your usual cup of latte, but I liked it, and if anything, I would order it just to support FairTrade! Conclusion: While most items on the menu were delectable, I’m afraid this veggie meal was definitely not healthy, with most foods either deep fried or cooked with lavish amounts of cream or cheese. 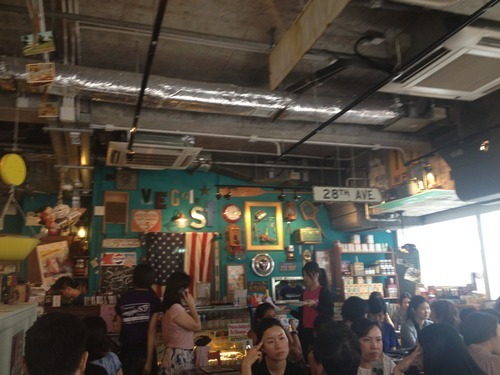 I would not recommend VeggieSF if you are looking for a detox meal – this is more of a place for vegetarian junk food! 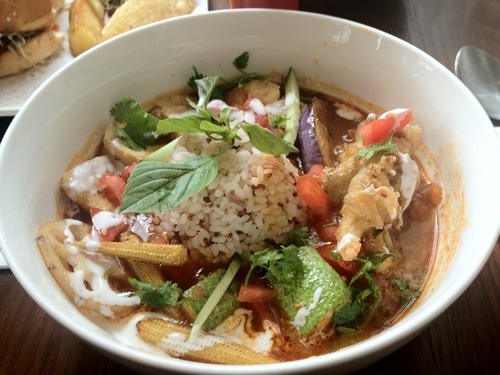 You could try Mana or Life Cafe instead for healthier vegetarian cuisine.